[150 Pages Report] The speech analytics market size is expected to grow from USD 756.9 Million in 2016 to USD 2,175.8 Million by 2022, at a Compound Annual Growth Rate (CAGR) of 18.2% during the forecast period. The base year considered for this report is 2016, and the market forecast period is 2017–2022. The major growth drivers of the speech analytics market include an increasing focus on higher customer satisfaction, rising significance for real-time speech analytics solutions, adherences of regulatory and compliance standards, and growing demand for speech analytics solutions to cater growing BPO sector. The main objective of the report is to define, describe, and forecast the global speech analytics market by components (solutions and services), applications, deployment models, organization sizes, industry verticals, and regions. The report provides detailed information regarding the major factors (drivers, restraints, opportunities, and industry-specific challenges) influencing the growth of the market. The report aims to strategically analyze micromarkets with respect to individual growth trends, prospects, and contributions to the total speech analytics market. The report attempts to forecast the market size with respect to five main regions, namely, North America, Europe, Asia Pacific (APAC), Middle East and Africa (MEA), and Latin America. The report strategically profiles key players and comprehensively analyzes their core competencies. It also tracks and analyzes competitive developments, such as partnerships, collaborations, and agreements; mergers and acquisitions; new product launches and new product developments; and Research and Development (R&D) activities in the speech analytics market. The speech analytics ecosystem comprises vendors, such as Verint Systems (US), Avaya (US), Calabrio (US), Clarabridge (US), Voci Technologies (US), Zoom International (Czech Republic), NICE Systems (Israel), Genesys (US), HPE (US), CallMiner (US), and Almawave (Italy). Other stakeholders of the speech analytics market include research organizations, network and system integrators, speech analytics managed service providers, Business Intelligence (BI) solution providers, marketing analytics executives, third-party providers, and technology providers. The speech analytics market is expected to grow from USD 941.1 Million in 2017 to USD 2,175.8 million by 2022, at a Compound Annual Growth Rate (CAGR) of 18.2% during the forecast period. The speech analytics market is gaining traction, owing to an increased prevalence of voice, phone interactions among consumers while interacting with customer representatives to resolve their service issues. Other major factors, such as focus on higher customer satisfaction, rising significance of real-time speech analytics, and an increasing need for speech analytics solutions from the Business Process Outsourcing (BPO) sector, are expected to drive the global speech analytics market. Various organizations operating in various industry verticals have been developing an interest in transcription and analysis of customer and organizational media and make informed decisions for customer and business management with the help of text and speech intelligence. The report provides detailed insights into the global speech analytics market. It is segmented by component, application, deployment model, organization size, industry vertical, and region. By component, the market is divided into solutions and services. The solutions segment outperforms the services segment and would see the maturation in the future due to the higher adoption. As a result, professional services are expected to gain traction in the next five years. Among applications, the customer experience management applications segment is expected to dominate the global speech analytics market throughout the forecast period. Speech analytics empowers organizations to use historical and real-time customer data to identify patterns and trends and devise retention strategies and reduce customer churn. This would help companies to enhance customer experience. The cloud deployment model is expected to grow at a higher CAGR during the forecast period. Cloud-based solutions are gaining a firm hold in the speech analytics market due to various benefits, such as cost control, resource pooling, and less implementation time. Speech analytics solutions witness an increasing demand across industry verticals, such as BFSI, retail and eCommerce, telecommunications and IT, and healthcare and life sciences. With the largest market size, the BFSI vertical is expected to dominate the speech analytics market during the forecast period, due to the growing importance of speech analytics to enhance the customer satisfaction, increase the retention rate, and reduce the customer churn rate. The retail and eCommerce industry vertical is expected to grow at the highest CAGR during the forecast period, due to the growing application of speech analytics to gather market intelligence, enhance business processes and risk management, and improve customer experience management (CEM). Large enterprises are expected to dominate the market in terms of market size, as such they are keenly focusing on CEM to encourage repeat business and improve customer loyalty. However, the Small and Medium-sized Enterprises (SMEs) are expected to grow at a higher CAGR, owing to the easy availability and scalability of cloud-based deployments. The report covers all the major aspects of the speech analytics market and provides an in-depth analysis across North America, Europe, Asia Pacific (APAC), Middle East and Africa (MEA), and Latin America. North America is expected to hold the largest market share and dominate the market from 2017 to 2022, due to the presence of a large number of solution vendors in the US. APAC offers potential growth opportunities, as deeper technology penetration and large investments in contact centers that are turning towards speech analytics solutions to efficiently gain insights from customer interaction data. Integration with existing systems and selection of right approach and difficult to quantify Return on Investment (RoI) would restrain the speech analytics market growth during the forecast period. 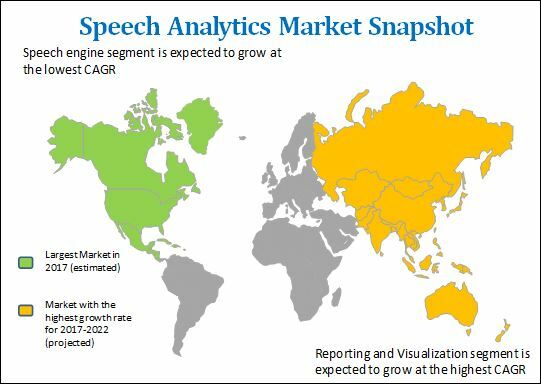 The global speech analytics market is fragmented in nature, as no single vendor dominates the market. Major vendors of speech analytics software and services include Verint Systems (US), Avaya (US), Calabrio, (US), CallMiner (US), Clarabridge (US), Almawave (Italy), Voci Technologies (US), Zoom International (Czech Republic), NICE Systems (Israel), Genesys (US), and HPE (US). These vendors have adopted different types of organic and inorganic growth strategies, such as new product launches, partnerships and collaborations, expansions, and acquisitions, to expand their offerings in the speech analytics market.